We’re not buying any meat for the month of September. I’m trying not to eat eggs. But every time there was a sale on meat, we’d rush out to buy a bunch. Grass-fed ground beef on sale at EarthFare for $3.99/lb? I’ll take 10. Chicken breasts at EarthFare, $2.99/lb? 5 would be great! Beef tenderloin on sale for $9.99/lb? 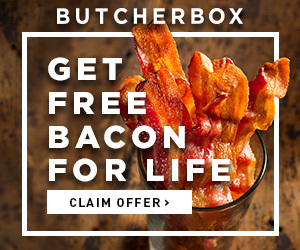 We’d just buy the whole thing and cut it into steaks ourselves. I mean, since we have an entire stand up freezer now, why not? As for me not eating eggs, this is actually an experiment. The hardest part for me is I LOVE EGGS. I seriously have been eating them almost every day since we went Paleo, and I never get sick of them. Isn’t that weird? But I love them. I love how versatile they are, how many ways you can prepare them, and how many things you can use them in. BUT. I’ve been fighting terrible cystic adult acne for a couple of years now. It’s hormonal (I have PCOS, which is a story for another day), so it’s not caused or cured topically. I went to see a homeopathic doctor, who has me on a number of supplements, and I started using Alba’s Acnedote line. (Which I seriously love, by the way. Makes you feel so clean!) I saw some improvement, but not the amount I wanted. So I kept reading, and doing research, and I read over on PaleOMG that Juli stopped eating eggs because they caused cystic acne for her. So I thought, hell, might as well try it! I’ve been avoiding them for the majority of the month, and have probably only had three or four eggs total, not including the ones I’ve baked into muffin experiments. I’m still working on those damned pumpkin muffins. I think it’s working, which makes me really happy and sad at the same time! I’m going to miss eggs. They’ll be a treat though, on the rare occasion that I do eat them. 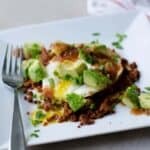 And when they make an appearance for something as delicious as this huevos rancheros recipe – you can rest assured that I’m going to eat them! I had a few of these awesome tortillas leftover from when I made those fish tacos, and I wasn’t sure what to do with them – I wanted to use them for something other than a taco. I saw the leftover chorizo from the pizza with that awesome crust, and a ripe avocado that needed eating, and it was game on. Yes. I made you a recipe out of leftovers. I’m resourceful, clearly. You’re welcome. Since I’m posting so many recipes using chorizo, I suppose it would be nice if I provided you a Paleo recipe for it, wouldn’t it? I can’t claim my chorizo as my own recipe. We have two recipes we use for this. One is out of the Primal Cravings cookbook . 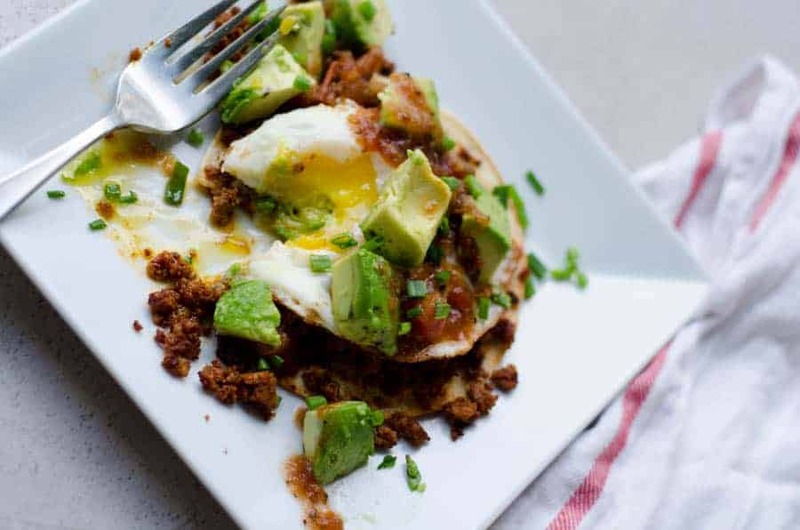 This is my super easy go-to chorizo recipe, because I can have it mixed in under 5 minutes flat. I alter theirs a little bit by cutting the cayenne pepper in half (it’s pleeeenty spicy already!) and I sub mustard powder for the onion powder, only because my onion powder solidified into a lump and I couldn’t get it out of the jar one day. As a side note, that cookbook is amazeballs. It’s got great recipes in it, and lots of traditional stuff that you might be missing if you’ve gone Paleo. The authors have since “quit” Paleo and aren’t updating their blog anymore because they’re running a CrossFit gym, but that’s neither here nor there. The recipes are still on point. The other recipe we use for chorizo is out of the Beyond Bacon cookbook . I got Brandan this cookbook a couple of years ago as a Christmas gift. I asked a local restaurant owner and butcher if I could order some cuts of pork from him to pair with the book as part of the gift, and he responded and asked if I’d like to instead have him give Brandan a private butchering lesson in the restaurant. Pretty sure I won the award for Best Gift Ever that year! Their chorizo recipe is a bit more labor intensive and time consuming, but it is worth the work. The end result is the best, most flavorful chorizo ever. 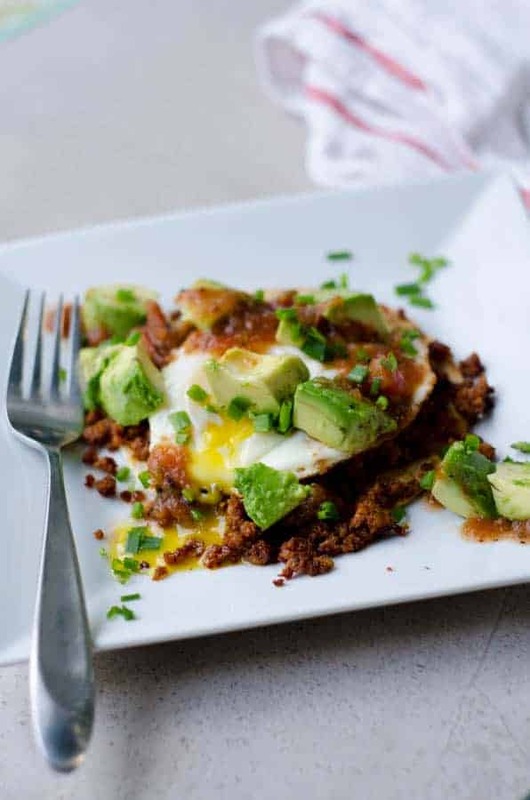 For now, though, we’re just going to work with my slightly modified version of the Primal Cravings chorizo, because that is the quickest most efficient way to get this plate full of deliciousness onto the table! My favorite part about this recipe is that you can make the whole thing using one pan. As long as you heat everything in the right order, one pan and 20 minutes is all you need, and gourmet brunch is served! Or, if you’re me, dinner. 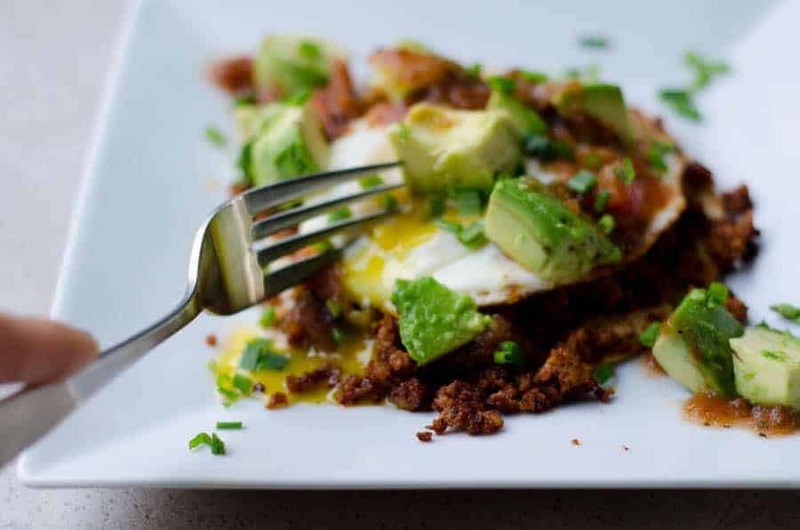 Because there’s nothing better than breakfast food for dinner. And I’ll make an exception for the eggs on this one, it’s that good. Heat a large non-stick skillet over low-medium heat. Add the tortillas to the pan one or two at a time in a single layer. Cook 3-4 minutes per side or until browned on the edges, then remove to plates and keep warm. Add the chorizo to the pan and turn the heat up to medium-high. Cook 8-10 minutes or until cooked through, then divide evenly between the 4 tortillas. Leaving the grease from the chorizo in the pan, crack the eggs into the pan and cover. Cook until over-medium or desired level of doneness. 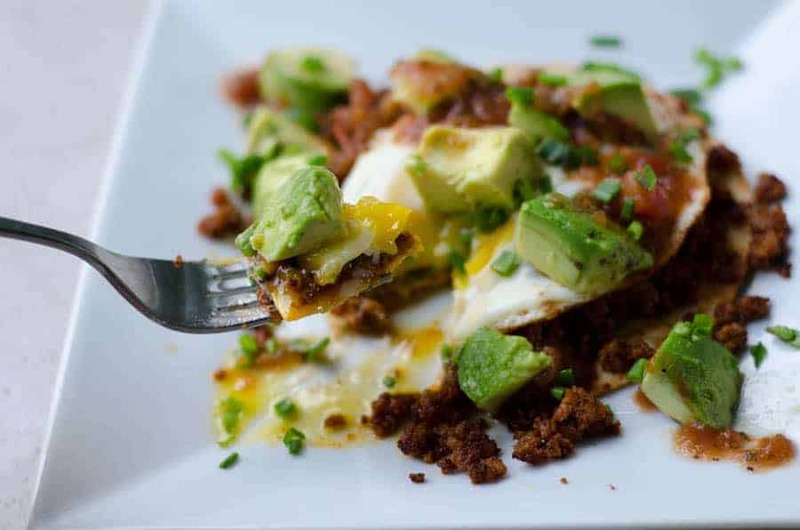 Top each plate of tortilla and chorizo with one egg. Top with diced avocado, salsa, and chopped fresh chives and cilantro and serve immediately.